Learn about the best practices for building university scorecards and measuring various aspect of the performance with Key Performance Indicators (KPIs). In this article, we will discuss the subject and the purpose of measurement, and stakeholders’ involvement. We will analyze the indicators that are used by the ranking organization and the metrics that are popular on the dashboards of universities. In the end of the article we give away some templates and examples of the KPIs that one can use to start building a scorecard for their educational organization. 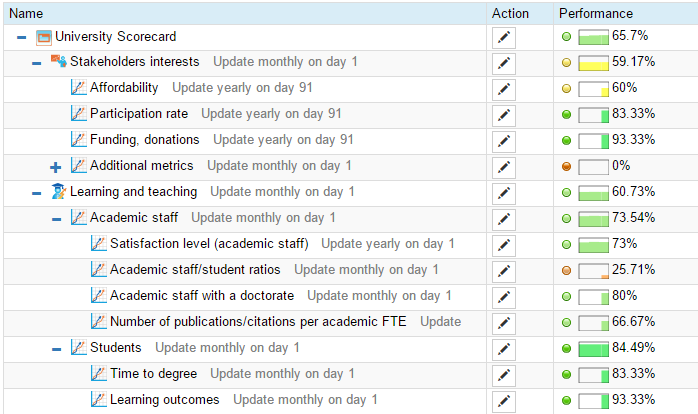 University Scorecard online - sign-up with a free account for immediate access to 16 scorecard templates. A basic model of a university. How does a university work? Participation rate, %. The percent of representation of certain group of the population among students. Retention rate, %. Students retained in study as measured from course to course. Graduation rate, %. The percentage of the students who successfully completed their qualification. Employment outcomes. See “Ranking Indicators” section for specific details. 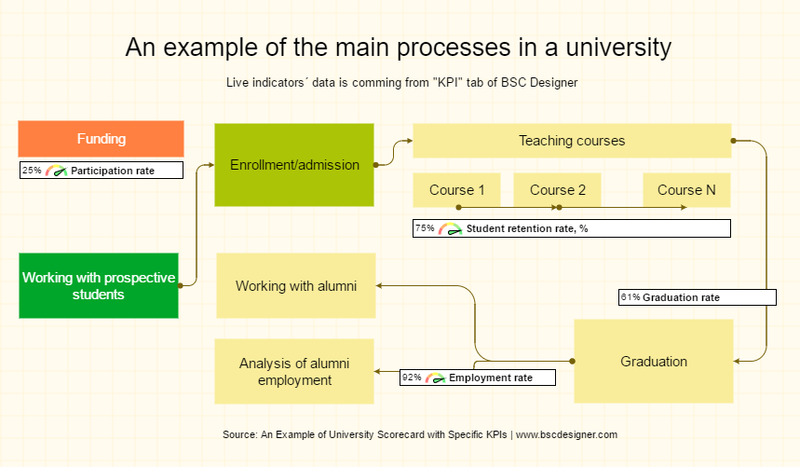 Here and below, to illustrate some of the ideas I will use the screenshots from the University Scorecard created with BSC Designer. This scorecard will be available for public access (see the links in the end of the article). You will find this process map on the “Strategy map” tab (be sure to switch between maps to access the right process map). The persons and the systems involved. Stakeholders. Whose interests should we take into account when a defining strategy and performance measurement system for a university? The context of measurement. What’s the purpose of measurement? Why do we need a scorecard or the KPIs? What challenges do they help us (and our stakeholders) solve? Prospective students and their families, face a challenge of choosing the university. They need to have some benchmarks, some common ground for the comparison of the universities. Ultimate goal of the students is to be prepared for future. For example, they want to understand how their courses are aligned with what is required by the future employer, and what are their chances to get good employment after graduation. Professional staff need to compare themselves month to month and improve; they also need to justify a spending budget. A proper evaluation system will help academic staff to improve, and will help management to decide about any reward. 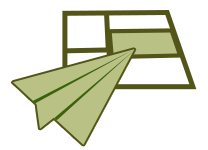 Learn more about surveys and the ways to improve them. Now we have the context for the measurement being defined, and the candidates for the KPIs are much easier to find. In some cases, the metrics, benchmarks, and respective measurement methodology are available publicly. For example QS shares the details about their methods for general ranking, as well as for the employability ranking. 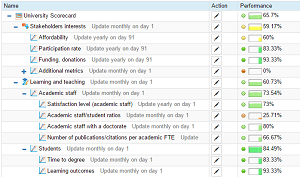 Many universities use the position in such rankings as one of the performance indicators on their dashboards. At ARWU website one can find references to other global and national ratings. On the one hand the rating metrics do their job. They serve as a common ground for the benchmarking; they help prospective students to shortlist universities, and help funding organizations to support their decision. On the other hand, a university is not a production line. Standard metrics won’t take into account many intangible values. The metrics from the rankings are too general and as a result are not that useful for month to month self-improvement process. For example, a popular citation index is not well accepted in some countries, and it makes perfect sense, as excellence in research and education should not be counted just by the number of the publications. Another example is employability, while it is one of the key metrics in English-speaking countries, but in other countries it is not so popular. For example, in Russia  employability indicators are not explicitly used on the dashboards of the top universities. On that point management needs to decide on a tailor-made performance management system that would track key parts of a university’s strategy execution. Common practices. 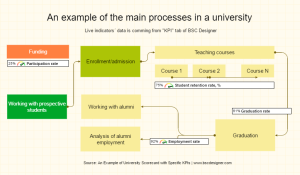 What KPIs do other universities use? Below you will find references to the studies of the performance indicators in the education sector. On the one hand, these studies give us an idea about what metrics are being used, on the other hand, they confirm that there is no common performance measurement framework for the universities. Another research was done by Dawn Terkla . She analyzed the dashboards of 66 colleges and universities and categorized her findings. What indicators should universities use then? The best idea is to design tailor-made KPIs. To support this creative process we have a 12-step system for challenging KPIs that anyone can use. The example below demonstrates an approach that one can use to build a scorecard for a university. Show how those goals form a coherent strategy. For this purpose many for-profit organizations use the 4 perspectives suggested by the Balanced Scorecard approach. In the case of the educational organizations, there is no such agreement. Universities are trying to capture their unique values and strategies in various ways, respectively the names of the perspectives vary. Whatever approach you prefer, be sure that your perspectives are not just simple containers for the indicators, but they help to describe the cause-and-effect logic of your strategy (see Known challenges section for more details). Universities have to balance their strategies between the requirements implied by the funding, academic, and community needs. Below you will find an example of a strategy map for a university that you can use as a starting point for building your own strategy map. Lagging indicator: Financial aid, funding, donations, etc. Relationship with alumni. Build relationship with alumni to help new generations of students with their challenges. All of the indicators can be further developed. For example, more details can be added to the alumni indicators, for example profiling alumnus into those who replied to the message sent, who sign-up for events, who actually participated in the events, who signed-up for volunteering, and actually volunteered (speaking on events, mentoring students, etc. ), who became a sponsor, etc. It makes sense to look separately at domestic and international alumnus. A typical case for many scorecards is when the perspectives work just as containers for the metrics. University scorecards are not an exception: the perspectives are often used to group the performance metrics into different silos, but not to explain the cause-and-effect logic. In many cases the cause-and-effect is implied on the earlier stages of the strategy definition, but is not properly reflected on the scorecard. To avoid this, visualize the cause-and-effect logic directly onto the strategy map. On a typical dashboard of a university there are various versions of easy to measure metrics such as “student retention” and “graduation rates,” but only a few features hard to measure “employability” indicators. When choosing new indicators one needs to think about the cost and the value of the measurement. While the cost of measuring employability is high, the value for the prospective students and other stakeholders is also significant. Below we discuss how one can do better in such cases. By doing surveys you are interacting with the subject of measurement and have an influence on the observed process (Heisenberg’s uncertainty principle). Similar to a previous one: the survey questions are subject to different interpretation, so the results can be ambiguous. The lagging nature of the surveys make it hard to use this data for month to month improvement. An alternative way to learn about the performance would be to use observation (see the Step 6 of 12 step system for challenging KPIs). Let’s take library service as an example. In additional to the annual surveys, one can use data that is already there in IT systems and track the actual use of library services and its usability for the students (in real-time). The metrics in this case will be similar to what webmasters track to improve their presence in Google. We use indicators to improve, not to make things worse, but sometimes instead of helping to achieve desired results, indicators induce some unexpected behaviour. Regulating authorities start pushing a university towards improving retention and graduation indicators with the idea that mentioned indicators will be improved by improving the quality of education and services. Universities in their turn responded by establishing higher admission standards. The graduation rates improved, but the reason of the change is not the improvement in the quality of education. Before, we have discussed a similar situation of indicators misuse in a business environment, I believe some findings from that article will work for the university scorecards as well. The scorecard created for the management of the university will make less sense for other levers of the organizational structure. For example, universities’ libraries should have their own scorecard and respective performance indicators. It is important to have a clear idea about how different scorecards support each other. You can learn more about the ways to do this in the “Cascading/Alignment” article. In terms of software automation in the educational domain we see a positive trend. 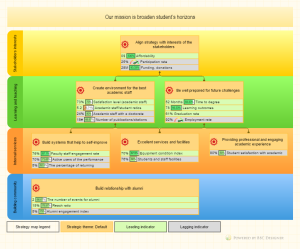 Many universities started using professional software for the purpose of building strategy maps and tracking KPIs. Among our users, we see more universities from Asia, Latin America and the Middle East. If you are an education professional, then we invite you to try BSC Designer software (both its Online and Desktop versions) for free during a 30-day trial period. To make your start easier, we suggest for you to use the University Scorecard template (with strategy map and KPIs) that was discussed in this article and that is publicly available (see the links in the end of the article). BSC Designer team is interested in learning your story, feel free to share your findings in the comments. University Scorecard discussed in this article as a starting template for your own scorecard! ^ Anderson, A. (1991). No citation analyses please, we’re British. Science, 252(5006), 639.